A commuter bus went up in flames Sunday night right by the Route 495 construction project, forcing traffic to a crawl as firefighters worked to put out the blazing fire. The bus caught fire on the eastbound side of Route 495 approaching Route 3. The riders on the bus were able to get off without being injured, but traffic was being slowed down in the area as crews worked to clean up the charred mess. 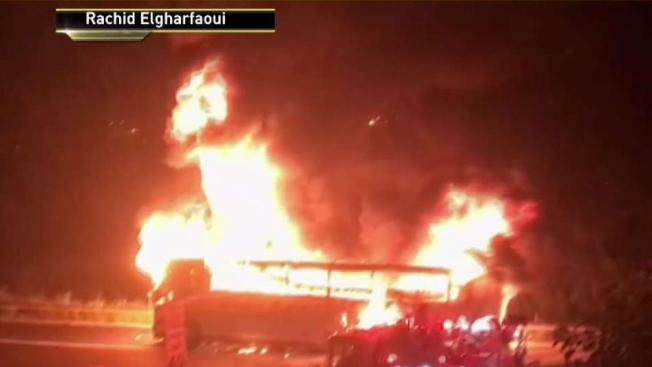 Video shot by Rachid Elgharfaoui and obtained by News 4 shows the huge flames shooting out of the bus as sirens are heard blaring in the back. The bus fire is the latest chapter of commuting hell on 495 as repair work got under way in earnest last week to rebuild an 80-year-old viaduct connecting the New Jersey Turnpike to the Lincoln Tunnel.